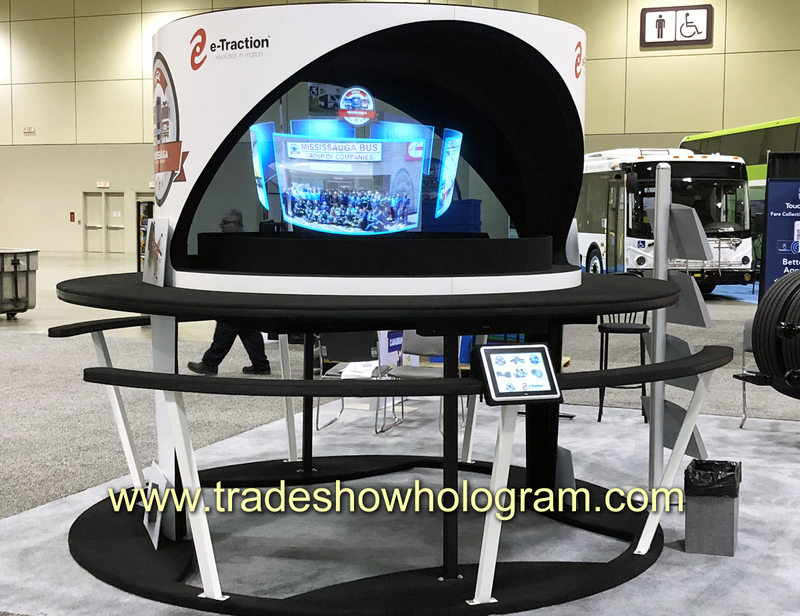 Trade Show Holograms was proud to exhibit their large sized Dual sided Hologram Projector in Toronto. As part of the Mississauga Bus Group of Companies / e-Traction booth at the 2018 CUTA ( Canadian Urban Transit Association ) Trade Show the display proved popular. This years trade show was held at the Toronto Convention Centre in Toronto, Ontario, Canada. The interactive dual sided display projected video presentations up to 3 ft tall and 5 ft wide into mid air. For that reason, the display proved popular and attracted trade show visitors to the MBGC trade show booth. It was viewed by a large percentage of show attendees. The Projector displayed detailed information on the new e-Traction electric drive technology. Because the display is a dual sided exhibit viewers are able to interact with different presentations on opposing sides of the display at the same time. The display features the Holographic companies new ” Ultra Bright ” technology. Ultra Bright Technology allows it to project bright clear high definition images therefore creating good images in a bright trade show environment. In a trade show setting, standing our from the other booths is a priority. For that reason alone many companies are introducing Holographic projection. This technology offers a unique and visual method in presenting a sales message or introducing a new product.